Colima is a city in the state with the same name. The state of Colima is one of the smallest states in Mexico. The city is located about one and a half hours inland from the more well known beach town of Manzanillo. Colima is about one half hour away from the nearest beach. Colima is situated higher in elevation then the coastal towns, and as a result, is cooler then the beach towns. Colima is the capital of the state of Colima. This city was founded in 1523, and is the third city founded after the Spanish Conquest. Can you name the first two towns founded in Mexico by the Spanish? They are Veracruz and Mexico City. Colima is less influenced by tourists because it is off the main tourist routes. I like this city because it still retains a flavor of “old” Mexico. This city is also located in a good location, it is only a short distance to the ocean. The main road connecting Manzanillo to Colima is in impeccable shape. There are very very few people who drive this road, and of those that do, it seems like a quarter are broken down on the side of the road. For those of us used to crowded city roads in the United States, the main roads around Colima are a relief from the congestion. Sometimes it looks like wispy clouds, but don’t be mistaken, it truly is the gas of the mountain. If that isn’t enough to worry about, Colima gets hit by earthquakes quite often, sometimes very large earthquakes such as in 1941. 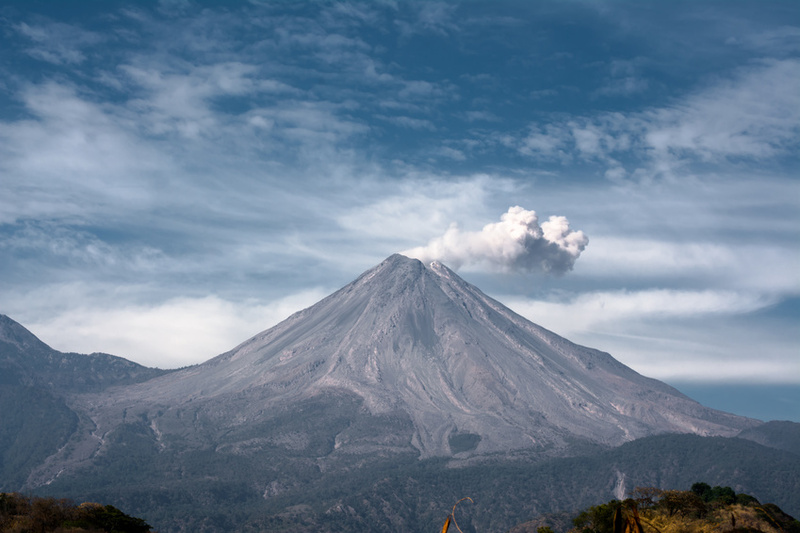 That would have been a very bad year to live in Colima…an earthquake and a volcanic eruption. The poor town must have been devastated. Even though Colima was the third city founded after the Spanish Conquest, and the first one in Western Mexico, it is because of the devastating earthquakes that there are extremely few colonial buildings left in town. Lastly, the coast of the state of Colima is sometimes subject to violent storms. I hope these disasters don’t scare you off from visiting Colima. They occur more often then most other places, but in reality, they really don’t occur that often. The above information isn’t usually what sells a location to the privy tourist, so I won’t dwell on it any longer. As an agricultural producer the Colima city area produces coconuts, (these can be seen for miles and miles as you approach the ocean from the city of Colima), lemons, bananas, and mangos. In the ancient times Colima was quite remote from the rest of Mexico. Historically the Colima area was famous for its pottery. This has been found by archeologists in over 200 different sites. Most of the pottery has been dated between 200BC to 800AD. Many of this pottery is a representation of the human form, as well as many pieces of dogs. Dogs held an important value in the lives of the ancient people who inhabited what is now present day Colima state. It was believed that dogs served as a pathway from earth to paradise. To these ancient peoples, dogs also had practical uses. They made up a substantial part of their diet. Today Colima city has a population of approximately 150,000. It has the feel of being a small city. Many of the small roads are shaded by many different varieties of tropical palms. There are many neat roads that slowly wind there way through small white washed cottages, and small businesses. I enjoy sitting on one of the many benches (see photo above) that were located in the several Mexican zocalos near the main part of town. This is a good place to watch the local people or listen to the local music.